Own a Kawasaki Bayou 300? 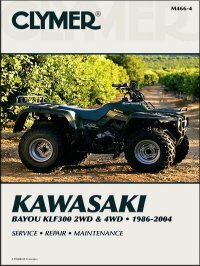 Kawasaki Bayou KLF300 2WD & 4WD Repair Manual 1986-2004 is available for only $26.95 from TheMotorBookstore.com. Largest selection of Clymer, Chilton, Haynes, Bentley and Seloc repair manuals at discount prices. This manual is for your Kawasaki Bayou 300, and covers the years 1986-2004.